یکی از دلایل عملکرد ضعیف فیلترها ناشی از شستشوی معکوس آنهاست. این پژوهش با هدف ارزیابی فرایند فیلتراسیون و عملکرد فیلترهای شنی تصفیه‌خانه آب اصفهان پس از شستشوی معکوس و با بررسی کدورت و شمارش زئوپلانکتون‌ها انجام شد. ‌مدت زمان این بررسی چهار ماه بود و در فیلترهای شنی فاز 1 و 2 تصفیه‌خانه انجام شد. به‌منظور بررسی عملکرد پس از فیلتراسیون، میزان کدورت و شمارش میکروسکوپی بررسی شد. میانگین تغییرات کدورت و شمارش زئوپلانکتون‌های نماتد و روتیفر در زمان‌های مختلف بعد از شستشوی معکوس مورد بررسی قرار گرفت. نقطه شکست کدورت و کاهش زئوپلانکتون‌ها بعد از زمان 15 تا 20 دقیقه شستشوی معکوس رخ داد. تعداد نماتدها و روتیفرها در فاز 1 تا زمان 10 دقیقه، به‌ترتیب 13 و 12 عدد در لیتر افزایش یافت و در زمان 20 دقیقه، به‌ترتیب به 7 و 9 عدد کاهش پیدا کرد. 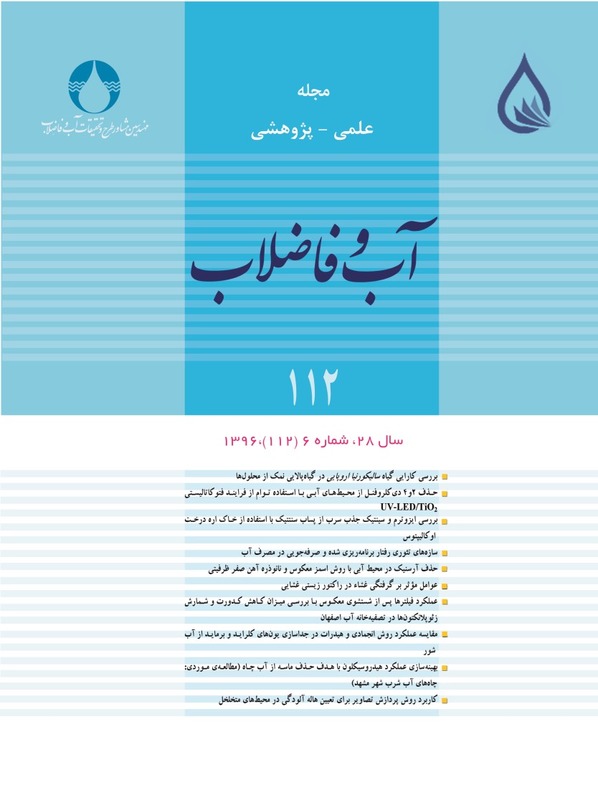 در فاز 2 نیز در زمان 20 دقیقه تعداد نماتدها و روتیفرها به‌ترتیب به 8 و 6 عدد در لیتر کاهش یافت. این تغییرات بر اساس آزمون t معنی‌دار بود (p<0.001). کدورت آب خروجی فیلترها نیز بعد از زمان 15 تا 20 دقیقه به کمتر ازNTU 2/0 رسید. برای محدود شدن تعداد ذرات معلق و ارگانیسم‌ها در آب خروجی بهتر است فیلتر 20 دقیقه بعد از شستشوی معکوس در مدار قرار گیرد. One of the reasons for poor performance of filters is their being backwashed. The purpose of this study is to evaluate filtration process and sand filters operation after being backwashed through examining turbidity and zooplanktons in Esfahan water treatment plant. This study was conducted during 4 months in the sand filters (phase 1 & 2) of the treatment plant. Turbidity and microscopic counting were studied to assess the performance after filtration. The average for turbidity variations and nematodes & rotifers counting were evaluated in different times after backwash. Turbidity break point and zooplanktons reduction occurred after 15-20 minutes of backwash. The number of nematodes and rotifers in phase 1 after 10 minutes increased respectively by 13 and 12 numbers per liter and within 20 minutes, it reduced to 7 and 9 numbers, respectively. Also after 20 minutes in phase 2, the number of nematodes and rotifers decreased respectively by 8 and 6 per liter. This changes were significant based on t-test (p <0.001). Also after 15-20 minutes, filters effluent turbidity reduced to less than 0.2 NTU. It is better to put filters in the circuit 20 minutes after being backwashed in order to restrict the number of suspended particles and organisms inside the effluent. Ahmad, R., Amirtharajah, A., Al-Shawwa, A. & Huck, P.M., 1998, "Effects of backwashing on biological filters", Journal of American Water Work Association (AWWA), 90, 62-73. Amburgey, J.E. & Amirtharajah, A., 2005, "Strategic filter backwashing techniques and resulting particle passage", Journal of Environmental Engineering, 131(4), 535-547. Elbana, M., de Cartagena, F.R. & Puig-Bargués, J., 2012, "Effectiveness of sand media filters for removing turbidity and recovering dissolved oxygen from a reclaimed effluent used for micro-irrigation", Journal of Agricultural Water Management, 111, 27-33. Emelko, M.B., Huck, P.M., Coffey B.M. & Smith E.F., 2006, "Effects of media, backwash, and temperature on full-scale biological filtration", Journal of American Water Works Association, 98, 12. Francors, R.J. & VanHaute A.A., 1985, "Backwashing and conditioning of a deep bed filter", Journal of Water Research, 19(11), 1357-1362. Gottfried, A., Shepard, A., Hardiman, K., & Walsh, M., 2008, "Impact of recycling filter backwash water on organic removal in coagulation–sedimentation processes", Journal of Water Research, 42, 4683-4691. Greenberg, A. D. E., 2005, Standard methods for the examination of water and wastewater, APHA.,AWWA. and WEF., USA. Huang, C., Lin, J-L., Lee, W-S., Pan, J.R. & Zhao, B., 2011, "Effect of coagulation mechanism on membrane permeability in coagulation-assisted microfiltration for spent filter backwash water recycling", Colloids and Surfaces A: Physicochemical and Engineering Aspects, 378(1), 72-78. Kim, Y.H., Eom, J-Y., Kim, K-Y., Lee, Y-S., Kim, H-S. & Hwang, S-J., 2010, "Applicability study of backwash water treatment using tubular membrane system with dead-end filtration operation mode", Journal ofDesalination, 261(1), 104-110. Liao, X., Chen, C., Wang, Z., Wan, R., Chang, C-H., Zhang X., et al., 2013, "Changes of biomass and bacterial communities in biological activated carbon filters for drinking water treatment", Process Biochemistry, 48, 312-316. Lin, W., Yu, Z., Zhang, H. & Thompson, I.P., 2014, "Diversity and dynamics of microbial communities at each step of treatment plant for potable water generation", Journal of Water Research, 52, 218-230. McCormick, N., Porter, M. & Walsh, M., 2010, "Disinfection by-products in filter backwash water: Implications to water quality in recycle designs", Journal ofWater Research, 44(15), 4581-4589. Mott, J., Mulamoottil, G. & Harrison A., 1981, "A 13-month survey of nematodes at three water treatment plants in Southern Ontario, Canada", Journal of Water Research, 15, 729-738. Qasim, S. R., Motley, E. & Zhu, G., 2000, Water works engineering: Planing, design, and operation, Prentice-Hall, Inc., New Dehli. Yang, J., Liu, W., Li B., Yuan, H., Tong, M. & Gao, J., 2010, "Application of a novel backwashing process in upflow biological aerated filter", Journal of Environmental Sciences, 22(3), 362-366.